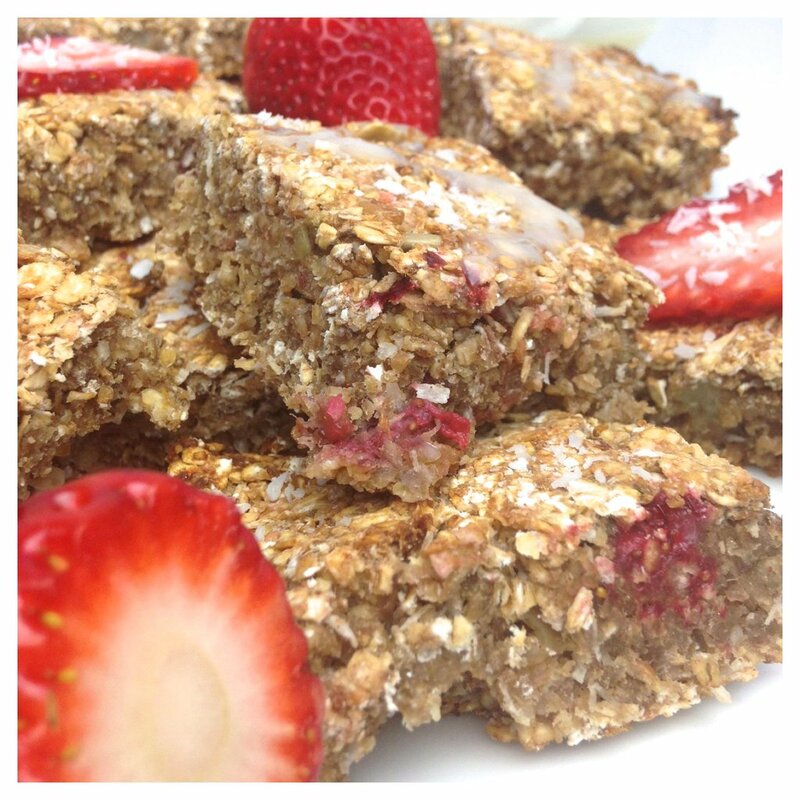 Healthy Vegan Flapjacks, packed with Protein,Strawberries, Lime, coconut and Spice.. I wanted to make a Healthy(ish) Vegan Dessert or Breakfast which was packed full of Protein. Recently, i've been wanting to eat a lot of Protein rich foods for my body as i feel i have been lacking in it. They are very rich and flavourful. I don't feel as guilty tucking into one of these, because i know its full of Nutrition. So why not give it a go, you won't be disappointed! This also is a great and easy recipe for young children to try out! Step 1- Pre-heat your Oven to 170 Degrees and get your FlapJack pan washed and ready. Step 3- Roughly Chop up the Bananas. Step 4- Put the chopped Bananas into a Large Mixing Bowl and slowly add in the Honey, Ground Almonds, Ground Ginger, Ground Cinnamon, Golden Linseed, Chia & Sunflower seeds, Lime Juice, Pea Protein and mashed Strawberries. Step 5- Mash them all together until they are a smooth consistency. you can use a food processor if you have one. Step 7- Scoop your mixture into a Large baking Tray, making sure you get right in to the edges. Smooth with a spoon for a flat surface. Step 8- Place the tray in the Oven for 30-35 minutes, and wait for the delightful smell to fill your home. Keep checking your FlapJack as the edges can easily burn if left un-checked. Step 1- In a small bowl, Scoop 2 Tablespoons of Dairy-free Yogurt( I used Alpro Soya) along with 4 Tablespoons of Iceing Sugar ( this gives it Sweetness but also make its thicker) and the 1/4 Teaspoon of Vanilla Extract. Step 3- Put into the Fridge, and leave to cool for 20 minutes! Step 10- When the Flapjacks have fully cooled, scoop them out of the tray and place sparsely on a Serving plate! Decorate with the Yogurt Drizzle,Strawberries, or Squeeze Lemon/Lime over the top for Moisture! Go all out and serve with a dollop of Dairy-free Ice-Cream or Soya Cream. Enjoy for a protein packed Breakfast with a dollop of Yogurt to keep you going all day! Anyway you choose....they taste delightful! I hope you liked this recipe, i came up with this myself by experimenting in the kitchen with my favourite foods and flavours.